I made a promise, my followers, and I shall keep it. I’ll use this space above the official header to talk about something that’s not the book. Reading. I am passionate about reading (I know, right?). But, I’ve stopped referring to it as reading, because the actual translation of text to image (or sound, or taste, or smell) is only part of the process. No, I don’t read. I commune. Say it with me. Let that ooooo roll off your tongue. If you aren’t willing to converse with the author, stop reading and wait for an attitude adjustment. Lord knows I’ve gone into books with a bad attitude. Doesn’t work out so well. I liked this. I had no idea what to expect going in, but I liked the cover, I liked the map. I liked the fact that it had illustrations. This was something that I could slip on like a Snuggie and curl up in a chair with. We bounce between two viewpoints. The first is Alek, an Austrian on the run from a war. The second is Deryn, a Brit crossing the channel to charge into the fray. Though this is billed as a YA, the characters did seem a bit immature at times. As the book progresses, the characters mature, sort of like real children of a war, so the early immaturity is understandable. Now, don’t tell anyone I told you this, but…this is the first book that I wanted to immediately begin reading the sequel. No digestion time, no waiting, just jump into the next installment. Don’t misconstrue. Leviathan is a complete and satisfying story arc, but there are still loose ends, and I was invested. However, I practiced self-control (and already blew my book budget for this month). Like I said, I don’t read back covers anymore. I was really, really surprised. The technology is the major difference. Walkers and fabricated beasties. Clanker and Darwinist. Different enough, eh? Another hook in the first ten (hey, this is my blog, I do what I want), is the sense of anxiety. We get about two pages of normal world, then, BAM, we’re running for our lives, and I’m huffing and puffing like Randy Parker stuffed inside his snowsuit (A Christmas Story reference in May; for shame). Westerfield is a strong writer. The characters are good. There’s a gun in the room from chapter three that keeps drawing our attention until, well, never mind. I won’t let that slip. It’s a quick read. Enjoy the illustrations, too. Those are nice. This entry was posted on May 13, 2011 by Kate Cornell. 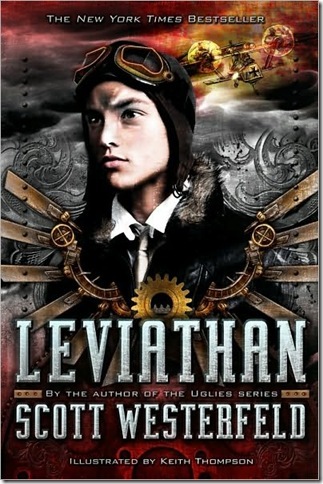 It was filed under Book Reviews and was tagged with book breakdown, book review, communing, leviathan, read, reading, scott westerfield.